Dr Seuss nursery themes and Dr Seuss baby bedding for your nursery are a great unisex, gender neutral nursery theme in bold colors. The red in the Cat in the Hat book displays such great visually stimulating primary colors that are perfect for a lively set of Dr. Seuss baby bedding.Nursery contrasts in black and white are excellent choices for baby's first nursery decor. A Cat in the Hat, Horton Hears a Who or Green Eggs and Ham or even a Thing One Thing Two nursery theme will guide your towards decorating your baby's room in primary colors that include our favorite, storybook characters. An added bonus of Dr. Seuss crib bedding is that it's gender neutral and guaranteed to tickle you and your baby! 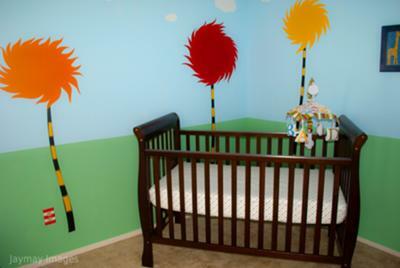 Take a look at the pictures of rooms decorated in many different Dr Seuss nursery themes with both homemade Dr Seuss baby bedding and craft ideas that will save money on your project. Each nursery reveal features wall decorating and painting ideas that will bring your favorite storybook characters to life. Cheap and easy is the ticket in designing baby rooms because you will want to change things around every time a new Dr Seuss accessory comes out! 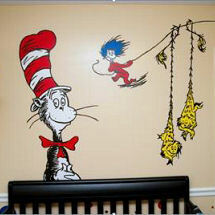 The Cat in the Hat motif features a Dr Seuss fabric print with colors of reds, whites and black. The interior design artist that came up with the pale, pastel yellow nursery wall and created such a unique color scheme was a genius! Share pictures of your baby Seuss nursery's. Give us the details of where you found your inspiration, ideas and your products that you used to achieve the designs. 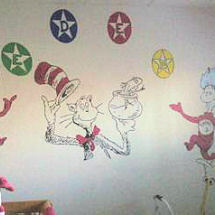 CHECK OUT MORE DR. SEUSS NURSERIES CREATED BY MOMS JUST LIKE YOURSELF! Dr Seuss Nursery Theme: Why Fit In When You Were Born To Stand Out? Who would have thought that a soft, yellow painted background would be the best nursery wall paint color that could be used with Dr Seuss nursery themes and the Dr. Seuss baby bedding sets? They've even thrown in some brilliant lemon yellows, lime greens and bright sea blues in the design of the Dr Seuss baby furniture. Dr Seuss baby gifts and nursery furniture are a perfect way to carry your Dr Seuss theme around the nursery. Kids will love coloring Dr Seuss pages on the table and chair set for years! 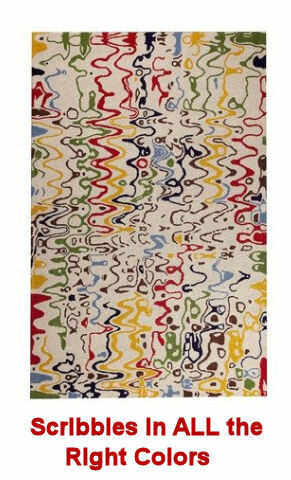 This Dr Seuss area rug has features a "scribbly" design in primary colors that will fit well with most Dr Seuss nursery decor. What about those cute little feet on the Dr Seuss furniture? It looks like it jumped off the pages of a Seuss book! 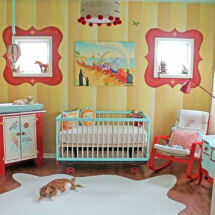 That's the kind of imaginative baby stuff that inspires really cool Dr Seuss nursery decorating ideas! Dr Seuss nursery themes have proven to be pretty versatile as far as the range of colors that you can use! I just love the vintage look of the iron baby crib in the picture, don't you? It probably could be used for a baby boy or a baby girl and in more than Dr Seuss nursery themes, too. For a baby girl, you could make it more feminine by hanging a gauzy white canopy over it if you didn't want to use the Dr Seuss baby bedding any longer. If you got tired of having to clean a white crib, you could paint it any color that you needed. I wonder if those black cribs show dirt like a white one does? 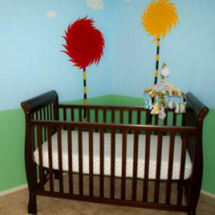 You could use a red or yellow baby bed in Dr Seuss nursery themes as well as cute Dr Seuss nursery decor! Anyway, if you wanted one of the Cat in the Hat Dr Seuss Nursery Themes this will surely put you in the game. 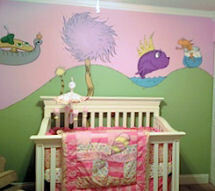 All the best wall colors, Dr Seuss crib decorations, wall decor, Dr Seuss infant furniture and accessories are there. They've accessorized this theme for you right down to the Dr Seuss nursery curtains, Dr Seuss lamps, Dr Seuss baby bedding nursery decorations and crib linens. There's even a plush Dr Seuss puppet. Here's a handy list of Dr. Seuss baby items you might put on your wish list with your other wanted baby gifts that will help you to create authentic looking Dr.Seuss baby nursery themes! 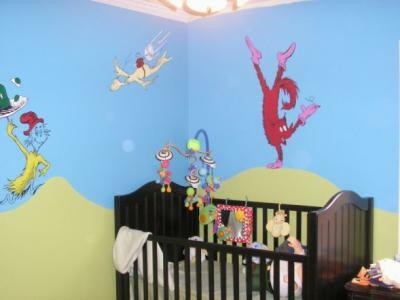 For more baby Seuss nursery ideas, please visit Unique Baby Gear Ideas' gallery of nursery pictures where you will find nursery tours and photos shared by real moms just like you!